Students at Churchville-Chili Middle School aren’t waiting for someone else to step up and solve the world’s problems: they are taking the initiative themselves. A group of concerned seventh-graders noticed too many potentially recyclable or compostable products going into their classes’ trash cans. They got together, did research and came up with a solid proposal for solving the problem. The group presented their ideas to school administrators and even applied for and won a grant from Monroe County to fund their plan. Now eight classrooms in the middle school boast recyling bins for paper, bottles and cans, and compost. Students hope to expand the pilot program, but in the meantime, they volunteer several hours a week of their own time to maintain the new system. It’s actually not surprising that these seventh-graders have initiated this action. As sixth-graders, many members of this class spearheaded the school cafeteria’s composting program. This year, a new crop of sixth-grade activists are carrying on and expanding the original vision. The new group members are currently working on a proposal and a plan to build their own system of compost collection and tumblers. Why are all these students independently putting so much of their own time and effort into recycling and making improvements to their school? Feature photo: Sixth-graders (l-r) Makayla Hazard, Phoenix Pape, Sophie Wanck-Kann and Billy Morgan get together at lunchtime every week to work on their plans for expanding recycling in their cafeteria. Not pictured: team member Ava Donaghue. 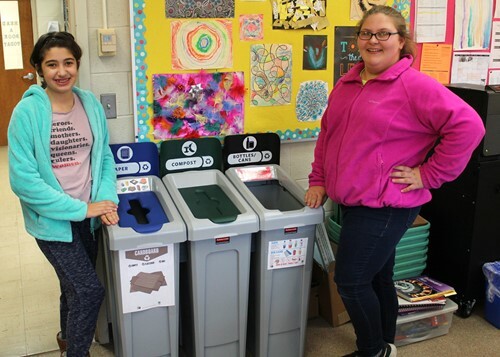 This page: Seventh-graders Jessica Magguilli and Kathryn Parisi show off some of the new recycling bins. Other seventh-grade team members include: Adrian Borchers, Ryan Giglia, McKenzie Ennis and Isabella Mettler.